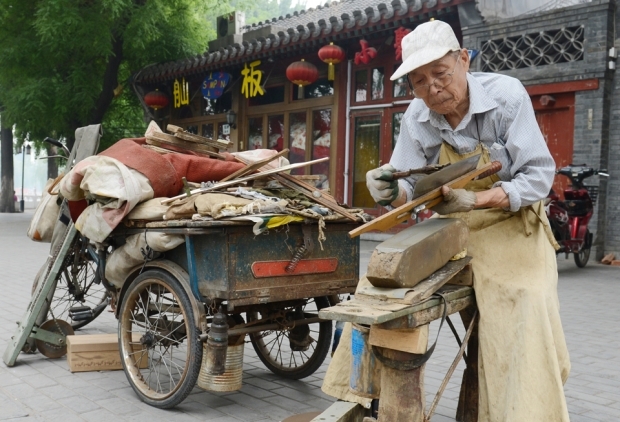 An elderly Chinese hawker sharpens a knife at the Houhai Lake area in Beijing on May 21, 2012. Chinese state press said on May 20 that Chinese Premier Wen Jiabao vowed proactive policies to make growth a bigger priority, as the world's second largest economy showed signs of weakness. China is facing a demographic reckoning that is approaching a nightmare. For thirty years, the government has been obsessed with keeping population growth down, often resorting to late-term abortions and other brutal measures. The panic now is that China is growing old before it has gotten rich. The 2010 census showed that the population grew barely 0.57 percent a year over the previous decade, and in major cities the rate was even lower. Adding insult to injury, the State Council recently forecast that the active labor force will peak in the next five years and start declining. The number of urban residents, defined as people living in townships and cities, will soon surpass that of rural areas, spelling the end of surplus rural labor ready to migrate to the cities. The demographic dividend that propelled China’s economic growth in the past three decades will be ending. Blame the ambitious social engineering of the family-planning policy. The one-child policy is something of a misnomer because parents who are single children are allowed to have a second child and ethnic minorities are exempt from the regulation. A couple needs to have 2.1 children for normal population replacement, but in China the fertility rate is only 1.5. As a result, the country will have too few young people in the future. Currently, about eight people in the active work force support one person 65 years old or older. By 2050 the ratio will drop to 2.2. Thirty years ago, overpopulation was seen as a curse, bringing poverty and underdevelopment. Only by keeping population growth under control could China free up resources for rapid modernization. The policy was never intended to be permanent. Three decades later, a looming labor shortage and social obligations to support a growing, aging population should argue for its abolition. It makes no sense to punish families trying to have more children. In fact, the opposite will be true soon. A desire for smaller families tends to accompany economic growth and development everywhere. China may need to use incentives to encourage young people to have more children. If the old family-planning policy has outlived its usefulness, the response from the Chinese government is baffling. It still extols the virtue of the one-child policy. Even a small step allowing a couple with one parent from a single-child family to have a second child is rejected. Experts attribute this policy inertia to the monstrous family planning bureaucracy, which from the national down to the village level employs half a million people. Some localities have even grown dependent on the fines levied on parents for having extra children. In the southern metropolis of Guangzhou, the hub of China’s manufacturing industry and always a harbinger for China, one does not see the impending demographic doom yet. In the streets are throngs of young people who come from other provinces for better wages and a bustling city life. Thanks to them, Guangdong province has an enviable labor force of 80 million people. But demographers in Guangdong estimate that the province’s demographic dividend will run out by 2020. The one-child policy, if left in place, means each future generation will be 25 percent smaller than the preceding generation, which means the source of migrant workers is drying up. Guangdong manufacturing bosses are already worried. While the momentum of internal migration has yet to slacken, rising labor costs in recent years are squeezing the profit margin. Some moved factories to inland province or overseas, but they have to contend with higher transportation costs and a less efficient supply chain. Even labor cannot be taken for granted. Foxconn, which assembles electronic products such as iPhones and iPads, built a new plant in the inland province of Sichuan, but there, too, it had difficulty filling jobs. The local county government, desperate to make good on its assurance of abundant labor, gave junior employees paid leave to take up jobs in the Foxconn assembly lines. Some economists have argued that better-paid workers can spend more and transform the economy from producers to consumers. However, if rising consumption comes from a much smaller young population, the overall effect on the economy is unlikely to be impressive. There’s an adage that if you wish hard enough, your wish just might come true. Thirty years ago, China’s family planning mandarins imposed the most draconian measures to keep population growth down to zero. They did not see that birth control and economic prosperity tend to make young people opt for fewer or even no children. In hindsight it was not all that difficult to have fewer children. Overlooked was the far more intractable problem of an aging population. Now the population time-bomb is ticking. The government must own up to the misguided policies and find sensible solutions. Nailene Chou Wiest is a visiting professor at the School of Communication and Design of Sun Yat-sen University.